Niklaus Troxler is an internationally renowned Swiss graphic designer who specializes in poster design, corporate design, illustration and architectural murals. Niklaus Troxler's jazz poster, 'A Tribute to the Music of Thelonious Monk' elegantly combines typography and color to create a portrait of the great jazz pianist and his music. 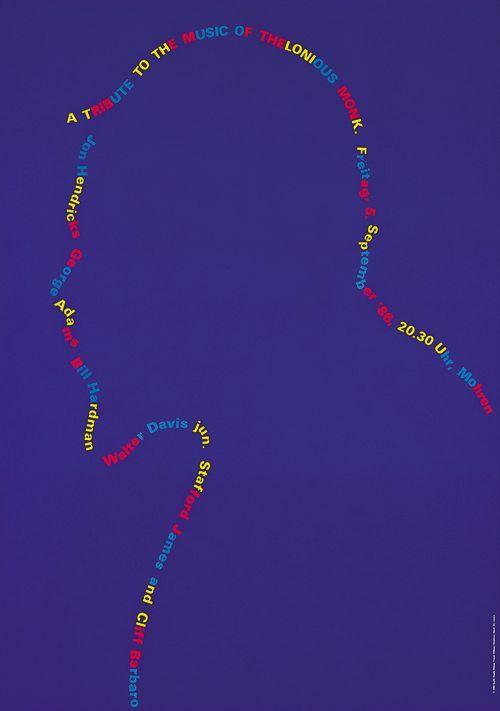 The typography outlines the recognizable silhouette of Monk's head in text of blue, red, and yellow, the colors of of his home state North Carolina. The rhythm that is created by the changing color of the words as they pulse around the profile evokes the tempo of his playing, while the deep blue background suggests the roots of his music. Since 1975, Troxler has organized the Willisau Jazz Festival, an international event that features the best in contemporary jazz. He also produces the festival posters which are all the exactly the same size due to Swiss bill posting restrictions. The Willisau Jazz Festival offers Troxler the perfect opportunity to merge his two passions of graphic design and jazz music into one unique concept. "Everything that fascinates me about jazz music, is also what interests me in design: rhythm, sound, contrast, interaction, experiment, improvisation, composition, individuality. I have been organizing jazz concerts for as long as I have been designing. Both activities have inspired me since the mid-1960s, and still have lost none of their fascination." Troxler’s posters are layered with visual puns and musical metaphors, executed in hand crafted illustration and typography. He tries to avoid the use of photography which he considers to be clichéd. Silkscreen and lithographic prints are the main techniques that Troxler uses to communicate both figurative and abstract ideas created from paper cut-outs, collage, stencils and brush and line drawings. The styles that Troxler uses in his poster designs fall into three main categories: Abstract, Typographic and Figurative. Troxler's abstract designs show the 1960’s influence of Geometric Abstraction and Op Art styles, as well as that of the Swiss graphic designer Josef Müller-Brockmann, whose formal designs are based on grid structures. 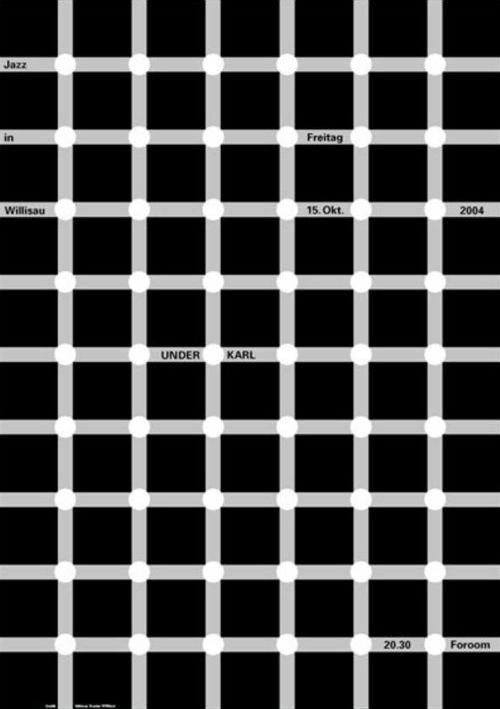 Troxler's poster for the 'Underkarl' concert uses an optical illusion known as 'the scintillating grid' whose dots effectively blink like light emitting diodes, an apt metaphor for Underkarl's electronic music. 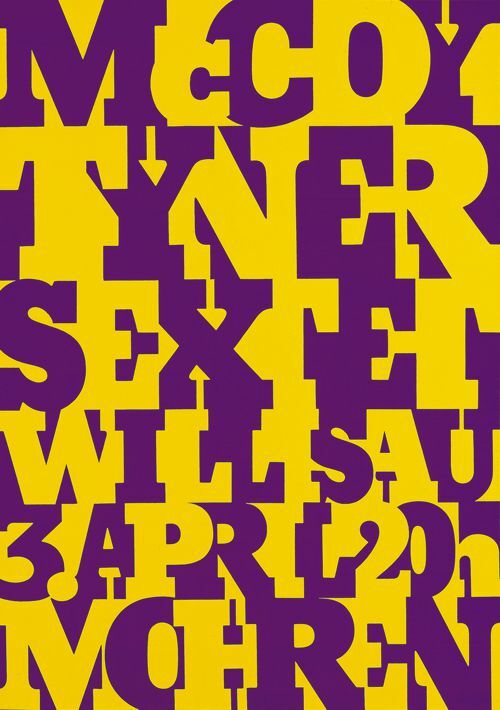 Troxler's hand crafted poster for the 'McCoy Tyner Sextet' works on two different levels. It is a modern design classic that stylistically forecasts the creative explosion of computer generated typographic design in the 1980's. On another level, the dynamic interaction between the positive and negative forms of the typography recalls the strong colour and pattern of African textiles. These bold abstract elements echo the African sounds and rhythms to be found in McCoy Tyner's music at this time. Troxler's eclectic figurative designs show diverse influences that range from the 1960’s pop influence of Pushpin Graphics to artists as different in outlook as the Fauve painter Henri Matisse and the Surrealist René Magritte. They also rejoice in his love of drawing which he expresses through a range of styles and techniques. Niklaus Troxler's poster 'Jazz Festival Willisau '78' draws on the surreal fusion of images that is found in the art of Magritte but it is executed in a comic book 'Pushpin' style. 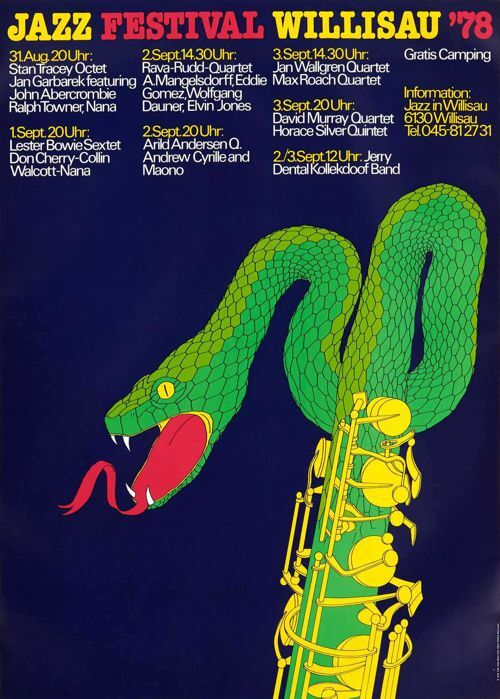 The illustration is of a baritone sax whose mouthpiece has transformed into a serpent. The hypnotic swaying of this venomous creature, augmented by its acid colours and cool blue background, suggests the kind of music and ambience to expect at the festival. 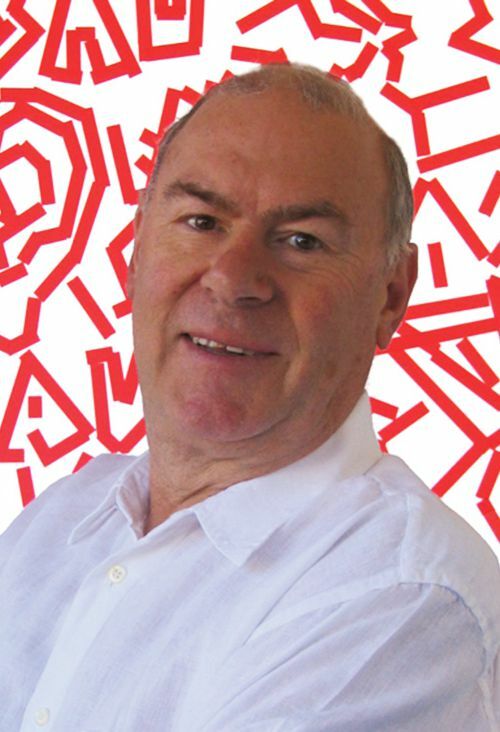 Niklaus Troxler is an internationally renowned Swiss graphic designer. He was born in Willisau, Switzerland in 1947. Since 1975, Troxler has organized the Willisau Jazz Festival, an international event that features the best in contemporary jazz. He produces the festival posters which are all the same size due to Swiss restrictions on poster sizes. The Willisau Jazz Festival offers Troxler the perfect opportunity to merge his two passions of graphic design and jazz music into one unique concept. Troxler’s graphic work is layered with visual puns and musical metaphors, executed in hand crafted illustration and typography. Troxler’s techniques include silkscreen and lithographic prints which communicate both figurative and abstract ideas created from paper cut-outs, collage, stencils and brush and line drawings. The styles that Troxler uses in his graphic designs fall into three main categories: Abstract, Typographic and Figurative. His abstract designs show the 1960’s influence of Geometric Abstraction and Op Art styles. His figurative designs show an eclectic range of influences from the New York design studio, Pushpin Graphics, to artists as diverse in style as Henri Matisse and René Magritte. Although Niklaus Troxler creates a diverse range of designs in a variety of styles and techniques, all are indelibly stamped with his visual identity and are immediately recognizable as his work.